tl:dr – Are we headed to MySpace? While I love the ease of use and increasing approachability of some of the WordPress plugins showing up in the marketplace, I can’t help but worry that by giving people some of these tools, we’re going to end up with some of the ugliest sites seen, since the days of MySpace. This is not the ultimate in Drag and Drop WordPress page builder comparisons. That’s another post I’ve been working on, as I compare at least 10 different plugins/themes. 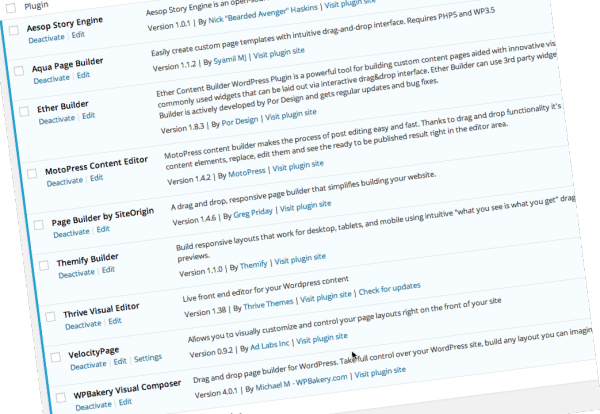 Over the last two weeks I’ve been putting several plugins and themes through their paces to evaluate a new (to me) set of page builders that are now available to all my WordPress friends. If you haven’t read my first review, you might like it. But even though that post is a bit old, people visit it daily. Hundreds of folks. And they regularly write comments, asking about other page builders that I didn’t include the first time around. And lastly, when VelocityPage came out, I was excited to check it out – and wrote about it again, had people sending the questions in about other options. Have you checked out xxxxx and don’t you think this might be the last plugin I’ll ever have to buy? Look, I get it. We all want the same things, right? We want to live in freedom, without dependency and without tax. If you’re a developer, you want to create the perfect site, based on how you understood requirements, and then give it to a customer. And be left alone. Right. To live the rest of your life in freedom from their constant calls asking for a tweak here or there. The tax of customers. I know, I made that sound worse than reality, but check your heart before you protest. If you’re a designer, you want the freedom to create the perfect solution without the constraints of technology, or the tax of having to pay developers who still don’t understand your pixel perfect layouts. I know, you work well with your dev partners, but check your heart before you protest. If you’re a site owner, you want the freedom to focus on your business without needing to rely on a developer who refuses to answer the phone, meet before noon, and who understands that you don’t care about technology for its own sake. The dependency is the tax. I know, you don’t think it should be this hard to find good help. Drag and Drop WordPress page builders are the future. When I was in college, my two roommates and I decided that we would build our own bedroom furniture. In fact, I’m sad to say it also happened again a year after I graduated as well. The first time we decided to build a large frame that would be sized to fit the bedroom of our apartment, and on that frame, we’d basically hang large (8′ x 4′) wooden platforms, two to a side, across from each other. Basically, imagine walking into a room with bunk beds on opposite walls, except that the bottom bunks were a bit higher than normal because they were desks and we slept on the top bunks. We learned many things in the course of building them – like don’t drill and hammer late at night or all the neighbors would call, scream, and threaten to call the cops. Or that we should sand the wood, or enjoy the pain of splinters. But maybe the biggest lesson we should have learned was that real people do this professionally, and we weren’t those people. We spent far more than what it would have cost to buy loft beds and desks. The second time I participated in the same exercise (different roommates), my roommates decided to sand the wood while it was inside our apartment. We lived in sawdust for months. Everywhere. I don’t even remember how many times we rented the steam cleaner from the supermarket to try to clean our apartment and make it livable. But the cost was higher than buying loft beds. My point? It’s pretty simple, if you hadn’t guessed. Everyone thinks that it will be fun, exciting, and cheaper when doing DIY projects. And while that may be partially true, I find that the lower cost isn’t always a feature of those DIY projects. And let me ask you this – do you really want your website to be a DIY project? I think we can all agree that we know what looks good when we see it. But you know what the problem is? Well, the first is that our taste doesn’t match our wallets. We love sites that cost hundreds of thousands of dollars over several years. And we want one that looks just like it, right? But there’s another problem. The skill of evaluating other’s creations is not the same skill as creating things on our own. That’s what designers do. And you, my friend, may not be a designer – just because you installed Visual Composer. I’m a public speaker, much more than I’m a writer. So it won’t shock you that I’ve been accused, sometimes, of having verbal diarrhea. It’s a horribly funny challenge by a friend now and then when they challenge me to say anything in less than 10 minutes. But when I think of MySpace (yes, I actually did have a very plain site for a little bit), I can’t help but use the same notion – Visual Diarrhea. And while I don’t have the facts to prove my case, I’d submit that one of the reasons MySpace ended up looking so ugly was because people didn’t actually think it was ugly. Take a second to consider that. I’m saying that people actually thought they were doing cool things – you know, like scrapbooking. Put lots of stuff together, on top of each other, with lots of colors. Scrapbooking was (don’t know if it still is) a multi-Billion (yes B) industry. So what I call diarrhea was called art by someone else. See, I think the worry I have is that when people have the option to drop tons of stuff on their pages, in an effort to create their own Aesop story-like posts, they’ll do it without the cost of designers and production teams. And they’ll think it looks good. But we’ll end up creating the next version of MySpace (I’ve lost count of what version they were on, so I can’t say 2.0 or 3.0). What do we do when people put all these objects on a single page? This is why I like VelocityPage – because they’re not trying to give users that complete DIY experience, while still helping with some basic layout options. It’s why I like Barley – because they’re focused on helping people add content easily without getting into visuals. And it’s why I like Headway for designers who want that pixel perfect way to draw their own designs on a canvas, without the need for these page builders. But I know this single post won’t stop you all from circling back for that page builder comparison. I know you’re still looking for that freedom without any tax. And I know you’re likely to dream of a day when you can do everything yourself. I think there are some situations where they’ll be helpful. I’ll address those in the comparison post. But for now I’ll simply suggest that drag and drop page builders may not be the thing that saves us all.